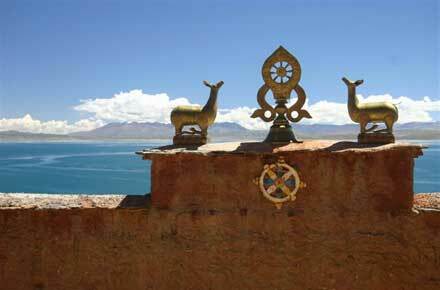 A sacred circumambulation of this beautiful lake high in western Tibet, a place of pilgrimage for Buddhists and Hindus. 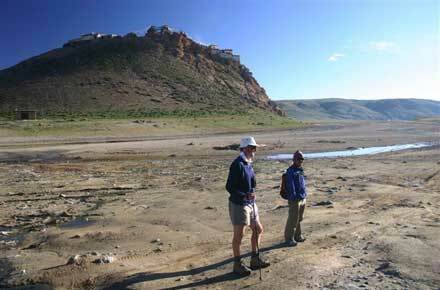 Superb scenery, including views of 7,694m Gurla Mandhata and the fabled Mt Kailash, and surprisingly interesting wildlife. Simple but inspiring Tibetan Buddhist monasteries at sacred points around the lake; mull on the tough life of the Tibetan plateau. This is a tough walk on which you will have to be self-sufficient and where altitude can cause real problems. Come prepared. 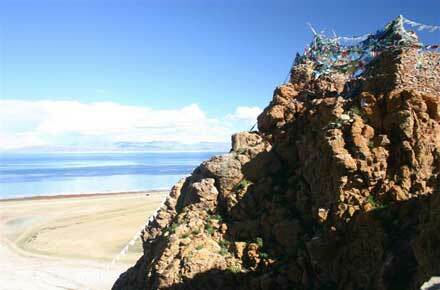 Manasarovar is the most venerated of all Tibets many sacred lakes. It is especially sacred to Hindus, who have been walking round it for approaching 2,000 years. Buddhists associate the lake with Maya, Buddhas mother. 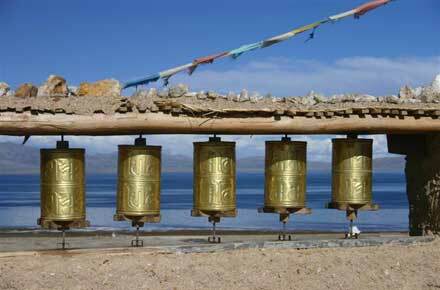 Hindu and Buddhist cosmology had it that nearby Mt. 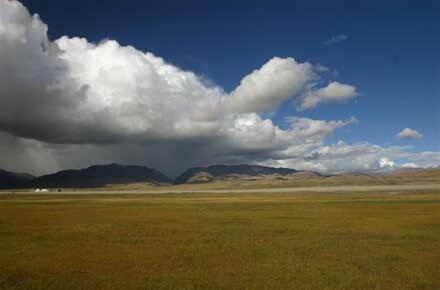 Kailash is the centre of the world and that Manasarovar is the source of four of Asias great rivers. There used to be eight monasteries around the lake, representing points of the Dharma wheel, until the destruction of the Cultural Revolution. Five of these have been rebuilt, in part at least. This has always been a poor, utterly remote area, inhabited by nomads and brigands, many months from the civilised world. The lakes monasteries are, as a result, basic affairs compared with the riches and beauty of the Tibetan heartlands, but no less moving for that. 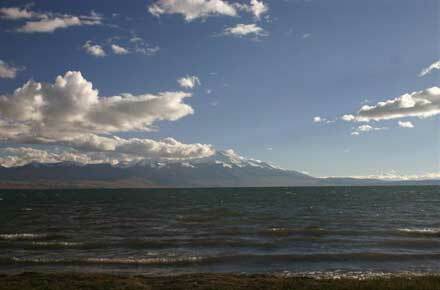 Manasarovar is said to be the worlds highest freshwater lake. 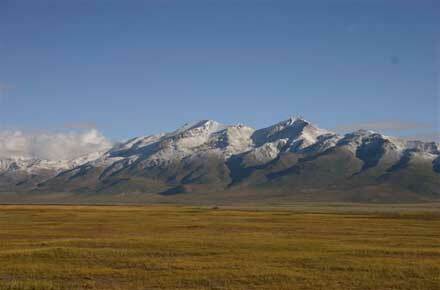 It lies on the high west Tibetan plateau, between the massif of Mt. Gurla Mandhata (7,694m/25,300ft) and the many-named range which runs, for some 1,000km, parallel to the Himalayas, sacred Mt Kailash presiding in full pomp at its heart some 40 km to the north. 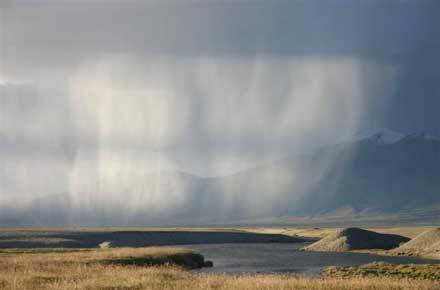 It is separated by a strip of low hills from Rakshas Tal, the Demon Lake, its cosmological opposite. The cold mountain light is extraordinary here. Distances are shrunk and views and colours can be flattened during the day, although they are superb at each end of it. The lake can shift from angry indigo, to dull pewter, brushed steel or polished silver, to wonderful lapis lazuli, all within 10 minutes. Pilgrims come here to perform the kora, the sacred clockwise walk around the lake, and Hindus ritually bathe in it. You meet groups of Indians, huddled and suffering in the cold, thin air, and tough, wind-burned Tibetans in their heavy fleece coats, trudging remorselessly around the lake, oblivious to things of this world such as startling natural beauty. Although dirt poor, they will have struggled their way for thousands of kilometres to get to this desolate place. 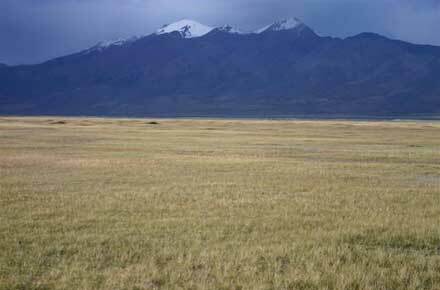 The walk around Manasarovar is nearly 90 km (56 miles) and takes four or five days. Few westerners do the whole walk; having travelled huge distances to get here, their time is usually tight, and they are often exhausted and ill after toiling round the nearby Mt Kailash kora. 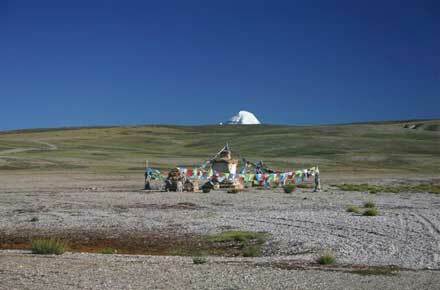 Travellers often do day walks in the best areas, especially around Chiu Monastery. Quite a lot of the walk is scrunching on the lakeside shingle, with an excursion over hills to the east of Chui, cutting inland to avoid the marshes of the northern shore. It is not all easy, with boggy areas and streams to ford, which can get full in summer. 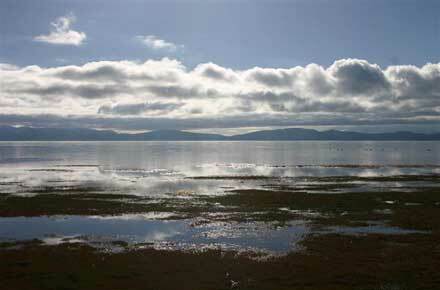 The best sections of the lake make very satisfying day walks, if time does not allow for a full circuit. 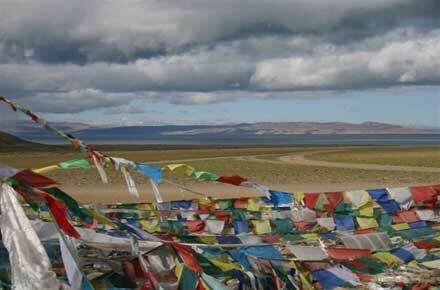 Manasarovar is the most venerated of all Tibet's many sacred lakes. It is especially sacred to Hindus, who have been walking round it for approaching 2,000 years. Buddhists associate the lake with Maya, Buddha's mother. 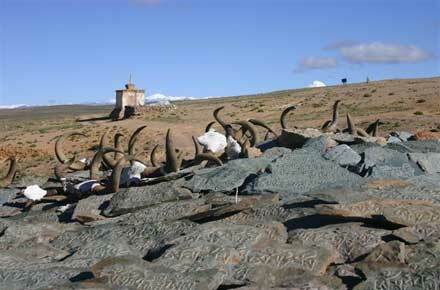 Hindu and Buddhist cosmology had it that nearby Mt. 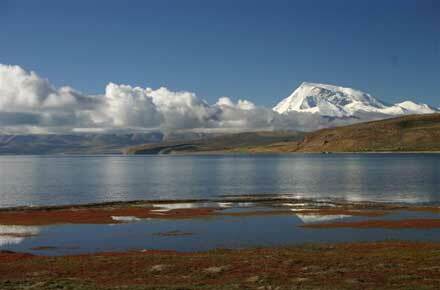 Kailash is the centre of the world and that Manasarovar is the source of four of Asia's great rivers. There used to be eight monasteries around the lake, representing points of the Dharma wheel, until the destruction of the Cultural Revolution. Five of these have been rebuilt, in part at least. This has always been a poor, utterly remote area, inhabited by nomads and brigands, many months from the civilised world. 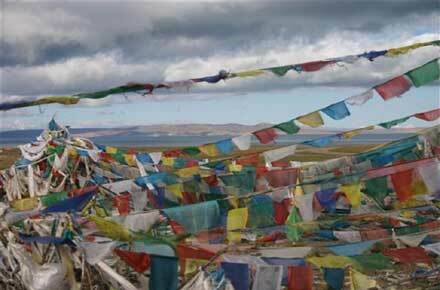 The lake's monasteries are, as a result, basic affairs compared with the riches and beauty of the Tibetan heartlands, but no less moving for that. 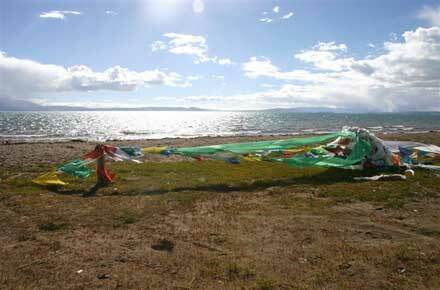 Manasarovar is said to be the world's highest freshwater lake. 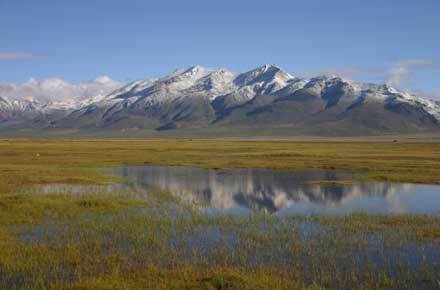 It lies on the high west Tibetan plateau, between the massif of Mt. Gurla Mandhata (7,694m/25,300ft) and the many-named range which runs, for some 1,000km, parallel to the Himalayas, sacred Mt Kailash presiding in full pomp at its heart some 40 km to the north. It is separated by a strip of low hills from Rakshas Tal, the Demon Lake, it's cosmological opposite. 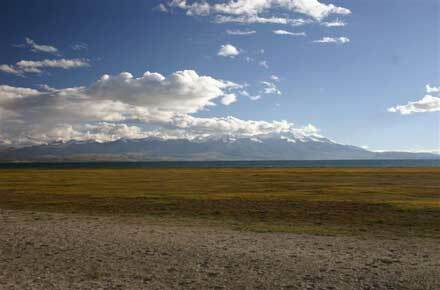 "We mountaineers were more strongly attracted to the majestic Gurla Mandhata, mirrored in the waters of Lake Manasarovar, than by the Sacred Mountain [ie Kailash]. We pitched our tents on the shore of the lake and feasted our eyes on the indescribably beautiful picture of this tremendous mountain, which seemed to grow out of the lake. This is certainly one of the loveliest spots on earth. The lake is held to be sacred and round it one finds many small monasteries in which the pilgrims lodge and perform their devotions. Many pilgrims creep round the lake on their hands and knees and carry home jars of holy water. Every pilgrim baths in its icy cold water. We did likewise, though not from piety. Here I nearly came to grief. After swimming out some little way from the shore I got into a boggy place from which I had only extricated myself with tremendous effort. My comrades had not noticed my desperate struggle to get clear of the mud. We wandered for some hours in an easterly direction along the lake and felt as if we were on a seaside walk. Our pleasure in the beauty was disturbed only by the midges which we did not get rid of till we were clear of the lake." 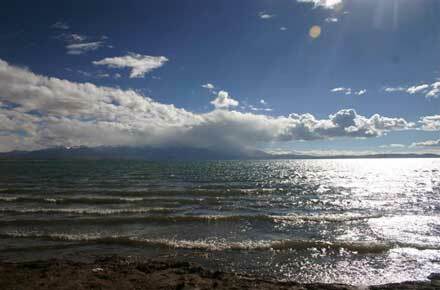 Mansarovar may not match your expectations of a sacred lake. Rather than a mistily numinous world of deadened sound, its icy waters lap its stony shores under a fierce, astringently beautiful light. 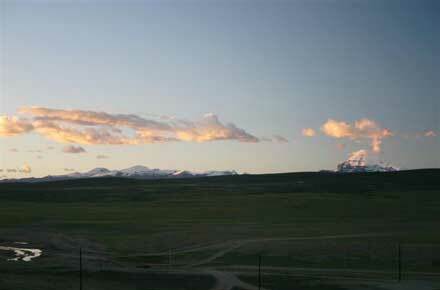 The air could not be clearer, or, at 4,560m (15,000ft), much thinner. It is not a kind place, rather one of pure contemplation and sharp ecstasies.